Graduated from the Faculty of Medicine, Universitas Gadjah Mada 1989, she then completed her master degrees in Maternal and Child Health from the University of College London in 1994 (British Council Awards), Master of Public Health in 1998 (STINT Awards), and Doctor of Philosophy from Umea University Sweden in 2002 (STINT and TDR Awards). In 2011 she was awarded as a professor in Public Health. 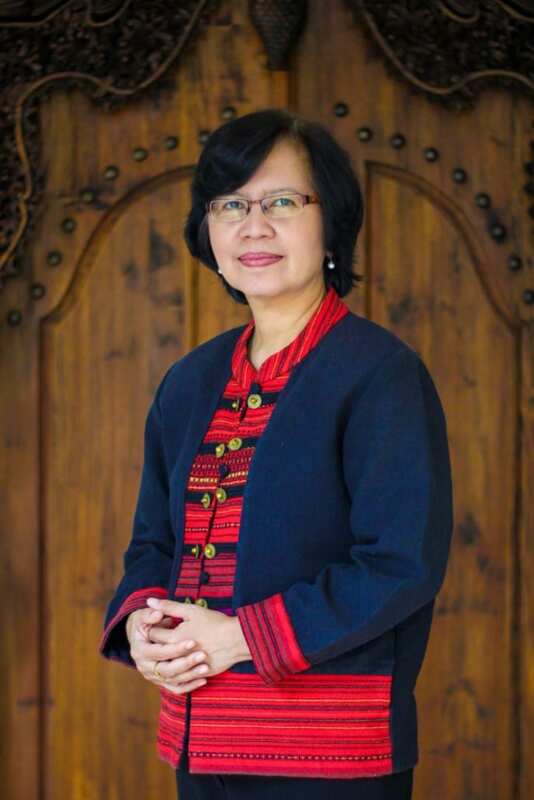 She was a member of the National Research Council (2015-on going) and previously served as the vice dean for research, community service and collaboration at Faculty of Medicine Universitas Gadjah Mada (2012-2016). In the field of health care quality, she is leading the quality compartment within the Indonesian Hospital Association. In parallel with her academic work, she still is currently active as a pianist, tennis table player, and cyclist. Her teaching activities focus on research methodology and quality policy and management. Ranked 311 best Indonesian researchers in all subjects published by Webometrics 2017, she published her work in about 30 international health journals. Her research focuses on management of desease control and health care quality, particulary in hospital care setting. She is also passionate in employing qualitative research and mixed-method research in health care. She is currently the Project Leader for Eliminate Dengue Project-Yogyakarta (2013-on going), a project applying Wolbachia Aedes Aegypti intervention to reduce dengue cases in Yogyakarta, funded by Tahija Foundation, Indonesia. In the field of health care quality, she is leading the development of national quality policy and standard in Indonesia, in collaboration with the Ministry of Health (c.q. Directorate of Quality and Accreditation) and WHO Jakarta. Valido EM, Laksanawati IS, Utarini A. Acceptability of the dengue vaccination among parents in urban poor communities of Quezon City, Philippines before and after vaccine suspension. BMC Research Notes (2018) 11:661. Joshi B, Lestari T, Graham SM, Baral SC, Verma SC, Ghimire G, Bhatta B, Dumre SP, Utarini A.The implementation of Xpert MTB/RIF assay for diagnosis of tuberculosis in Nepal: A mixed-methods analysis. Published: PLOS One August 10, 2018 https://doi.org/10.1371/journal.pone.0201731. Maula AW, Utarini A, Fuad A. Ten Years Trend of Dengue Research in Indonesia and South-east Asian Countries: A Bibliometric Analysis. Global Health Action. 2018;11(1):1504398.doi:10.1080/16549716.2018.1504398. Indriani C, Ahmad RA, Wiratama BA, Arguni E, Supriyati E, Sasmono RT, Kisworini FY, O’Neill SL, Simmons CP, Utarini A, Anders KL. Baseline characterisation of dengue epidemiology in Yogyakarta City, Indonesia prior to a randomised controlled trial of Wolbachia for arboviral disease control.The American Journal of Tropical Medicine and Hygiene. 2018 September 17. Nurrahmawati A, Utarini A, Hakimi M.Do Women In Rural Areas Still Prefer Homebirth With Traditional Birth Attendants? A Qualitative Study Of Women In Rural Area Of Kutai Kertanegara East Kalimantan. Public Health of Indonesia 4 (2), 73-82, 2018. Anders KL,Indriani C,Ahmad RA, Tantowijoyo W, Arguni E, Andari B, Jewwel NP, Rances E, O’Neill SL, Simmons CP, Utarini A. Appying Wolbachia to Eliminate Dengue (AWED): study protocol for a cluster randomised controlled trial to assess the efficacy of Wolbachia-infected mosquito deployments to reduce dengue incidence in Yogyakarta, Indonesia. Trials. 2018 May 31;19(1):302. doi: 10.1186/s13063-018-2670-z. Dewi FST, Wahab A, Indriyani C, Nugroho A, Lazuardi L, Ng Nawi, Santi R, Harisaputra R, Lestari S, Hakimi M, Susetyowati S, Utarini A, Choiriyyah I, Josef H. Designing and collecting data for a longitudinal study: theSleman Health and Demographic Surveillance System(HDSS). Scandinavian Journal Public Health. 2017 Jul 1:1403494817717557. doi: 10.1177/1403494817717557.Kristanti MS, Engels Y, Effendy C, Astuti, Utarini A, Vernooij-Dassen M. Comparasion of the lived experiences of family caregivers of patiens with dementia and of patients with cancer in Indonesia. International Psychogeriatrics.2017 Sep 5:1-12. doi: 10.1017/S1041610217001508. Mawarti Y, Utarini A, dan Hakimi M. Maternal care quality in near miss and maternal mortality in an academic public tertiary hospital in Yogyakarta, Indonesia: A retrospective cohort study. BMC Pregnancy Childbirth. 2017; 17: 149.Published online 2017 May 22. doi: 10.1186/s12884-017-1326-4. Hort K, Djasri H, Utarini A. 2013. Regulating the quality of health care: Lessons from hospital accreditation in Australia and Indonesia. Working paper series. Health Policy and Health Finance Knowledge Hub. The Nossal Institute for Global Health. The University of Melbourne. Number 28, May 2013.